The ultimate breakthrough in flat lashes! Achieve a voluminous, lash doubling look with Faux Mink X-Wrap™ eyelash extensions. These unique lashes make a dramatic statement from their full, dark base to their precise, tapered tips. The Faux Mink X-Wrap lash’s superior interlocking “X” shape guides the extension to wrap around the natural lash, locking it into place. This unique “X” shape also allows for strong lash attachment from any direction (top, bottom, or either side), giving more application flexibility than other flat lash shapes. The flat, wide base fills and corrects the appearance of gaps between natural eyelashes, giving an eyeliner effect along the lash line. Faux Mink X-Wrap lashes have a rich matte finish that mimics the sheen of natural lashes for a seamless integration. 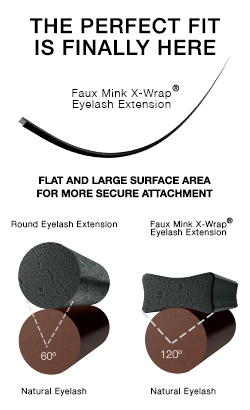 The superior interlocking “X” shape of the Faux Mink X-Wrap™ lash wraps and locks onto the natural lash resulting in tighter bonds, superior attachment, and longer-lasting lashes. Insider Tip:Use Faux Mink X-Wrap™ eyelash extensions exclusively to create a high-impact look for clients who desire a very dramatic result. By incorporating Faux Mink or Faux Mink Bold™ eyelash extensions throughout the X-Wrap design, you can add subtle softness for clients who prefer a more natural look. Faux Mink X-Wrap eyelash extensions help conceal gaps in a sparse lash line and provide a bold, voluminous lash look without compromising the health of your client’s natural eyelashes. 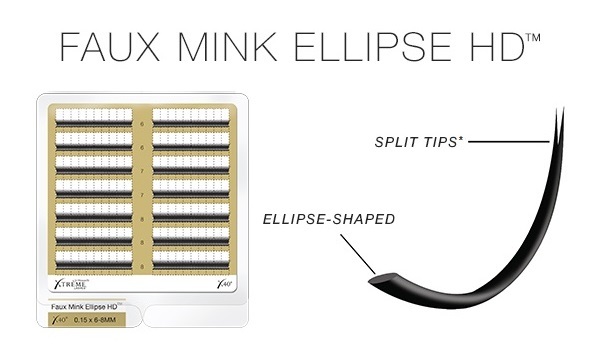 Note: Faux Mink X-Wrap™ lashes will replace Faux Mink Ellipse HD™ Lashes, and are available in the same lash tray dimensions as the Ellipse. Our most dramatic lash yet. Discover the volume-maximizing, lash-doubling, and corrective powers of Faux Mink Ellipse HD™ eyelash extensions from Xtreme Lashes by Jo Mousselli®. Utilizing an exclusive ellipse-shaped fiber with split tips*, this eyelash extension introduces a new level of magnified volume, texture, and definition with 47% less weight and improved longevity due to increased attachment surface area. 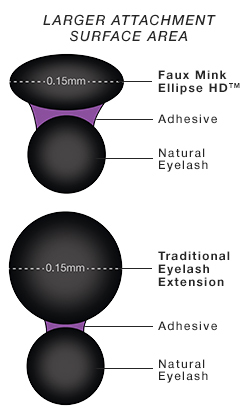 In addition to providing increased attachment surface area for adhesion, the flatter ellipse-shaped base also fills and corrects the appearance of gaps between natural eyelashes, creating a unique eyeliner effect and the illusion of a fuller natural lash line.